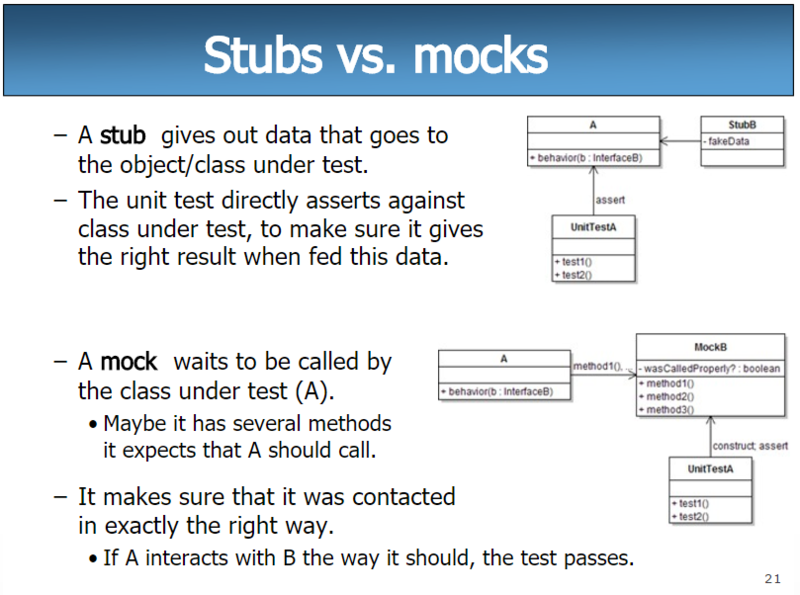 I've read various articles about mocking vs stubbing in testing, including Martin Fowler's Mocks Aren't Stubs, but still don't understand the difference. I believe the biggest distinction is that a stub you have already written with predetermined behavior. So you would have a class that implements the dependency (abstract class or interface most likely) you are faking for testing purposes and the methods would just be stubbed out with set responses. They would not do anything fancy and you would have already written the stubbed code for it outside of your test. A mock is something that as part of your test you have to setup with your expectations. A mock is not setup in a predetermined way so you have code that does it in your test. Mocks in a way are determined at runtime since the code that sets the expectations has to run before they do anything. Tests written with mocks usually follow an initialize -> set expectations -> exercise -> verify pattern to testing. While the pre-written stub would follow an initialize -> exercise -> verify. The purpose of both is to eliminate testing all the dependencies of a class or function so your tests are more focused and simpler in what they are trying to prove. There are several definitions of objects, that are not real. The general term is test double. This term encompasses: dummy, fake, stub, mock. According to the principle of Test only one thing per test, there may be several stubs in one test, but generally there is only one mock. Setup - Prepare object that is being tested and its stubs collaborators. Exercise - Test the functionality. Verify state - Use asserts to check object's state. Teardown - Clean up resources. Setup data - Prepare object that is being tested. Setup expectations - Prepare expectations in mock that is being used by primary object. Verify expectations - Verify that correct methods has been invoked in mock. Both mocks and stubs testing give an answer for the question: What is the result? Testing with mocks are also interested in: How the result has been achieved? Stub is simple fake object. It just makes sure test runs smoothly. Mock is smarter stub. You verify Your test passes through it. Here's a description of each one followed by with real world sample. Dummy - just bogus values to satisfy the API. Example: If you're testing a method of a class which requires many mandatory parameters in a constructor which have no effect on your test, then you may create dummy objects for the purpose of creating new instances of a class. Example: Create fake implementation for accessing a database, replace it with in-memory collection. Stub - override methods to return hard-coded values, also referred to as state-based. Example: Your test class depends on a method Calculate() taking 5 minutes to complete. Rather than wait for 5 minutes you can replace its real implementation with stub that returns hard-coded values; taking only a small fraction of the time. Mock - very similar to Stub but interaction-based rather than state-based. This means you don't expect from Mock to return some value, but to assume that specific order of method calls are made. Example: You're testing a user registration class. After calling Save, it should call SendConfirmationEmail. Stubs and Mocks are actually sub types of Mock, both swap real implementation with test implementation, but for different, specific reasons. For replacing a method with code that returns a specified result. A stub with an assertion that the method gets called. So as Sean Copenhaver described in his answer, the difference is that mocks set expectations (i.e. make assertions, about whether or how they get called). Stubs don't fail your tests, mock can. The easiest way to tell we’re dealing with a stub is to notice that the stub can never fail the test. The asserts the test uses are always against the class under test. Again, the mock object is the object we use to see if the test failed or not. That means if you are making assertions against the fake it means you are using the fake as a mock, if you are using the fake only to run the test without assertion over it you are using the fake as a stub. Stub: a dummy piece of code that lets the test run, but you don't care what happens to it. Mock: a dummy piece of code, that you VERIFY is called correctly as part of the test. Spy: a dummy piece of code, that intercepts some calls to a real piece of code, allowing you to verify calls without replacing the entire original object. A Mock is just testing behaviour, making sure certain methods are called. A Stub is a testable version (per se) of a particular object. What do you mean an Apple way? Mock is like actually stepping into the method and making sure everything inside is correct before returning the correct value. I think the most important difference between them is their intentions. STUB: The network connection to twitter API is very slow, which make my test slow. I know it will return timelines, so I made a stub simulating HTTP twitter API, so that my test will run it very fast, and I can running the test even I'm offline. MOCK: I haven't written any of my UI methods yet, and I'm not sure what methods I need to write for my ui object. I hope to know how my controller will collaborate with my ui object by writing the test code. By writing mock, you discover the objects collaboration relationship by verifying the expectation are met, while stub only simulate the object's behavior. Stub: A class or object that implements the methods of the class/object to be faked and returns always what you want. Mock: The same of stub, but it adds some logic that "verifies" when a method is called so you can be sure some implementation is calling that method. As @mLevan says imagine as an example that you're testing a user registration class. After calling Save, it should call SendConfirmationEmail. This slide explain the main differences very good. Using a mental model really helped me understand this, rather than all of the explanations and articles, that didn't quite "sink in". Imagine your kid has a glass plate on the table and he starts playing with it. Now, you're afraid it will break. So, you give him a plastic plate instead. That would be a Mock (same behavior, same interface, "softer" implementation). Now, say you don't have the plastic replacement, so you explain "If you continue playing with it, it will break!". That's a Stub, you provided a predefined state in advance. A Dummy would be the fork he didn't even use... and a Spy could be something like providing the same explanation you already used that worked. I like the explanantion put out by Roy Osherove [video link]. Every class or object created is a Fake. It is a Mock if you verify calls against it. Otherwise its a stub. A fake is a generic term that can be used to describe either a stub or a mock object (handwritten or otherwise), because they both look like the real object. Whether a fake is a stub or a mock depends on how it’s used in the current test. If it’s used to check an interaction (asserted against), it’s a mock object. Otherwise, it’s a stub. Fakes makes sure test runs smoothly. It means that reader of your future test will understand what will be the behavior of the fake object, without needing to read its source code (without needing to depend on external resource). What does test run smoothly mean? You want to test mailService.SendEMail() method, to do that you need to simulate an Exception in you test method, so you just need to create a Fake Stub errorService class to simulate that result, then your test code will be able to test mailService.SendEMail() method. As you see you need to simulate a result which is from an another External Dependency ErrorService class. Fake: Fakes are objects that have working implementations, but not the same as production one. Such as: in-memory implementation of Data Access Object or Repository. Stub: Stub is an object that holds predefined data and uses it to answer calls during tests. Such as: an object that needs to grab some data from the database to respond to a method call. Mocks: Mocks are objects that register calls they receive. In test assertion, we can verify on Mocks that all expected actions were performed. Such as: a functionality that calls e-mail sending service. for more just check this. Stubs are dummy implementations of production code that return canned results. Mock Objects act as stubs, but also include assertions to instrument the interactions of the target object with its neighbours. expectations set on stubs are usually generic, while expectations set on mocks can be more "clever" (e.g. return this on the first call, this on the second etc.). stubs are mainly used to setup indirect inputs of the SUT, while mocks can be used to test both indirect inputs and indirect outputs of the SUT. To sum up, while also trying to disperse the confusion from Fowler's article title: mocks are stubs, but they are not only stubs. See below example of mocks vs stubs using C# and Moq framework. Moq doesn't have a special keyword for Stub but you can use Mock object to create stubs too. I came across this interesting article by UncleBob The Little Mocker. It explains all the terminology in a very easy to understand manner, so its useful for beginners. Martin Fowlers article is a hard read especially for beginners like me. Stub is dummy implementation done by user in static way mean i.e in Stub writing the implementation code. So it can not handle service definition and dynamic condition, Normally this is done in JUnit framework without using mocking framework. Mock is also dummy implementation but its implementation done dynamic way by using Mocking frameworks like Mockito. So we can handle condition and service definition as dynamic way i.e. mocks can be created dynamically from code at runtime. So using mock we can implement Stubs dynamically. Stub helps us to run test. How? It gives values which helps to run test. These values are itself not real and we created these values just to run the test. For example we create a HashMap to give us values which are similar to values in database table. So instead of directly interacting with database we interact with Hashmap. Mock is an fake object which runs the test. where we put assert. I have used python examples in my answer to illustrate the differences. Mock objects are used in mock test cases they validate that certain methods are called on those objects. Mock objects are simulated objects that mimic the behaviour of real objects in controlled ways. You typically creates a mock object to test the behaviour of some other object. Mocks let us simulate resources that are either unavailable or too unwieldy for unit testing. This is a very basic example that just runs rm and asserts the parameter it was called with. You can use mock with objects not just functions as shown here, and you can also return a value so a mock object can be used to replace a stub for testing. More on unittest.mock, note in python 2.x mock is not included in unittest but is a downloadable module that can be downloaded via pip (pip install mock). A stub is a fake object built for test purposes. A mock is a stub that records whether expected calls effectively occurred. the best explanation ever with examples! Stub just returns canned data. Stubs are simple and straightforward — they’re essentially the simplest possible implementation of a method and return the same canned data every time. This gives us full control over returned values from methods that were invoke on the dependency. Mock object provides a way to check if object under test has called certain methods. There is a difference in that the stub uses state verification while the mock uses behavior verification. First the unit test creates the stub and configures its return values. Then the unit test creates the unit and sets the stub on it. Now the unit test calls the unit which in turn calls the stub. Finally the unit test makes assertions about the results of the method calls on the unit. Not the answer you're looking for? Browse other questions tagged testing mocking stub or ask your own question. An overview of unit testing terminology ( stub vs mock , integration vs. interaction )? How to use stubs in JUnit and Java? How do I set a property on a mocked object using Mockito? How to program behavior of a void method with Mockito? Are mocks better than stubs? What are the differences between mocks and stubs on Rhino Mocks? Why is it so bad to mock classes?